John Stewart, the man widely regarded as the ‘godfather’ of Australia’s epic Brucellosis & Tuberculosis disease eradication campaign in the 1970s and 80s, has passed away in Brisbane, aged 86. 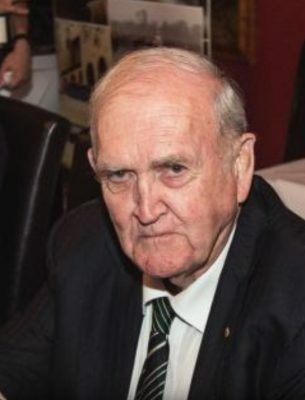 Mr Stewart spent long periods from the mid-1970s representing the beef industry, sitting on the Cattle Council of Australia for almost two decades, including lengthy terms as the national body’s vice president. He also served on Queensland’s Central & Northern Graziers Association, United Graziers Association and its successor, Agforce cattle boards. During the 1970s and 80s, Mr Stewart was general manager of Queensland Stations, one of the nation’s largest northern beef producers, which ran about 150,000 cattle on well-known properties like Wandovale, Miranda Downs, Carpentaria Downs, Van Rook and Dotswood. After the sale of Queensland Stations, he established a northern pastoral consultancy business out of Townsville, and continued to represent the industry in specialised fields like biosecurity and native title until recent times. CCA issued a brief statement acknowledging his passing, and his contribution both as a CCA councillor and consultant on animal health and welfare issues. “The list of positions John held in the red meat sector is too long to be mentioned here, but he will be remembered as a strong and respected advocate for the red meat industry,” CCA said. Former Meat & Livestock Australia chairman Don Heatley spent long periods with John Stewart on Cattle Council and broader industry representative matters. He agreed that his defining achievement was in driving Australia’s BTEC campaign, which against enormous odds, successfully eliminated TB and Brucellosis from Australia. The $1.2 billion project was influenced by US market warnings that it might suspend beef imports from Australia unless the disease could be brought under control in Australia. At the time Australia was almost totally reliant in the US as an export beef customer. Given the vast areas, relatively limited control of northern cattle in Australia at the time and logistical challenges involved, many felt that eradication of the diseases was not possible. “It took a strong personality like John Stewart to make it happen,” Mr Heatley said. “John was a mentally and physically tough man, and it took somebody with his character and ability to really drive the program to its ultimate success. It was not an easy process, and given the diversity in beef producers and thinking at the time across the nation, it created considerable some divisions. He was across the entire subject, at government level, science level and at producer level,” Mr Heatley said. Mr Heatley said Mt Stewart was a man of strong personal principles and ethics, and this transferred through to his contribution in industry representation. He represented the industry widely in biosecurity issues, native title and animal welfare until around 2010. A gifted footballer during his boarding school years at BBC in Brisbane, Mr Stewart represented Queensland in rugby. He passed away in Brisbane on Friday. A funeral service will be from 11am this Thursday, 18 April, at his former boarding school, Brisbane Boys College Chapel, Kensington Terrace, Toowong, Brisbane, followed by a gathering in the foyer of the College Hall. Successful industry reform needs an ability to build bridges, an attention to detail and stubborn persistence. Gentleman John Stewart had these characteristics in spades. He built bridges between the UGA and the CU, he had a scientist’s knowledge of animal health issues and he pursued reform for decades. A true champion of the Northern Cattle Industry. Deepest sympathy to Margaret & family. John was a special person. Very fond memories of our Vanrook days. Bruce & Meldie Wreford. My condolences go to Margret, family and friends of John. The industry has lost one of the greats. John’s legacy will last long, his contribution was immeasurable. I was fortunate enough to serve on Cattle Council and AgForce with John, his knowledge of the industry and animal health in particular was second to none and stood the Cattle Council in good stead. He played a leading parts in the BTEC campaign, setting up Animal Health Australia, the Cattle Compensation Fund and many other initiatives for the industry. RIP John, we will miss you. I wish to convey my sympathies to Mr. Stewart’s family and friends. I was with John as an NT delegate for the first three years of the North Australia Beef Research Corporation (NABRC) an initiative of John’s to foster and build on research for the Northern Beef Herd as the activities of the (MRC) Meat Research Corporation was wound down.. Then on Cattle Council with him as the NTCA delegate through the Red Meat Industry restructure and the final chapters of BTEC. The last nail driven to ensure its completion was the freight subsidies worked out principally by John for what was known as Class A and Class B infectious herds. Steadfastly holding the line against southern aversion to the final stages of the scheme was a feature of John’s work. He contributed very greatly to and always defended strongly the activities of (AAHL) Australian Animal Health Laboratory based at Geelong) and all of its associated work. He also strongly advocated for youth extension and education programs. John was a pleasure to work with, was always very clear in his intentions and the task in hand and quite enjoyed a robust conversation or two when the occasion called for it. Oh gosh. He was such a lovely bloke. I had a lot to do with him and his wife in Townsville in the 80s. Great community people — as well as John being such a quiet achiever. He’s earnt his turn in the spell paddock. I hope you all send him off in fine fashion.